Specially made for the Mavic 2 Zoom.This set includes ND4-PL, ND8-PL, ND16-PL.Skyreat polarizer filter reduce the amount of light coming into the sensor.with these filter for Mavic 2 Zoom, you can gain more freedom of control of the aperture, shutter, and create more exposure and creative space for photography, and effectively prevent excessive exposure. 【Mavic 2 Zoom Accessories】Filter Specifically made for the DJI Mavic 2 Zoom. 【Multi-Coated】Multi-coated glass for pristine Optics,reduced lens flaring. 【Aircraft Aluminum】Aircraft aluminum construction-lightweight gimbal safe design. 【Enhanced Gimbal Balance】Filter can be left on during Mavic 2 Zoom startup. 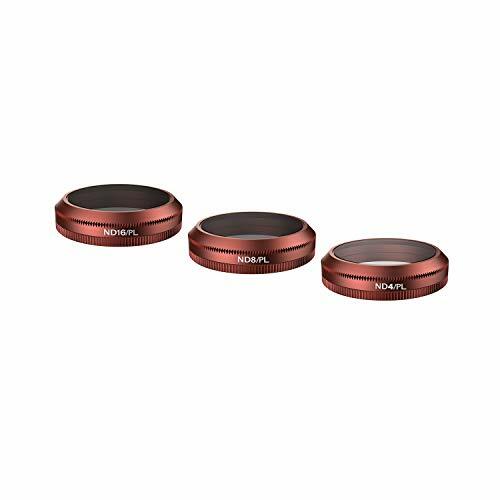 【Common Combination】DJI Mavic 2 Zoom polarizer filter set includes: ND4-PL,ND8-PL,ND16-PL.Lifetime Warranty. View More In Filters & Accessories.